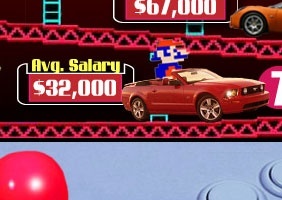 How much can you make in the videogame industry? Here's a handy graphic that lets you know. Plenty of people want to make videogames for a living, but how much you can make doing that is never really brought up. Until now that is, thanks to an infographic about average salaries for various positions in the industry, courtesy of Maxim of all places. The figures quoted are apparently taken directly from the people themselves via Game Developer Research, and the descriptions also offer up a few tidbits of trivia, like of all the jobs in game development, women are most often producers. The infographic itself is too big to post, but you can see it in all its splendor here. I still have one question. What is the equivalent of picking up a sledgehammer and beating Donkey Kong to death in the Gaming Market? There's gotta be one if you want to compare it to Mario! Got a question though it might be a stupid one, where are the writers in this chart? Those are some pretty generous figures. Definitely in the higher tiers of the pay scales for those jobs, that is a fact. Entry level is significantly lower, and the actual averages are also a good deal lower, before you factor in bonuses and profit sharing. At least in the companies I've seen. Ok, ok, bad joke, I get it. I just couldn't resist. Either it's included under Game Designers ("...with a creative background in writing...") or it's just not included. Certainly is interesting information, anyway. 70K for an artist position, That's comforting. Hmm...intersting, I did think the numbers on chart were a bit too high. What's the salary working for the Escapist? Cookies, and the joy of being given cookies. Not donuts, nor Waffles though. Unless you beg for a bonus. Dang, thats a lot of money, I'm guessing its not an easy industry to get in to, and not to stable ether considering Heavenly Sword only broke even. That's what I thought, they seem to be taking these statistics from Bioware and Square Enix and other such companies. So my animation degree will be worth about $70,000? Awesome. True, but at the same time there are a large number of jobs within these areas - for example, in the "game designers" section the role "Lead Designer" is mentioned, but that still leaves little mention of "Level designers", "Writers". All of which would have different wages. Is $67000 a year a lot? No surprise. The fragging MARKETERS get the lion's share. Ok ok...that's not entirely fair, but the pay scale alone should show you where the REAL focus in the industry lies, and it isn't with the people who actually MAKE the games. Glad to see Composer and Programmer up there though, even if they make considerably less than the spinsters and mouths/suits. So that's how Gabe affords all that food! Sorry, I couldn't resist a Gabe Newel is fat joke when a common question is how does he afford all that food. These numbers seem high. Maybe they're true, and I hope they're true, but I hope these figures are medians or approximate modes, not means that could be dramatically altered by a few high-paying companies, and/or neglecting entry-level workers. Thats actually a lot more than I thought they made. Freaking awesome. That's pretty good. Even the bottom rung of the steady workers make nice money. Considering the source, that being Maxim, I wouldnt buy those figures for anything. - How many companies is this the average of? - Which companies is this averaged across? Yea, that's why I wanna focus on film industry animation; Paid more and treated better than you are in the games industry. I interned at a motion capture place during college that did the animation for Prey and it was pretty mind numbing after a while of fixing animation.